It is encouraging to see some of the specific quota reductions made for U.S. exports laid out in the TPP, as increasing our country’s exports can help protect domestic T&A manufacturers. However, since other countries’ T&A goods are becoming increasingly attractive to the U.S. due to other policies created through TPP, I am curious to see if our increased exports will be trumped by an even higher increase in imports. It is also interesting to note how this fact sheet calls TPP a “balanced deal,” as this was most likely created in a political context by a group that wishes to gain greater public support for TPP. But as we know, TPP will always come with winners and losers and can never be truly “balanced” and benefit everyone at the same time. Excellent comment! PS: distinguish tariff with quota. Tariff is a kind of tax which makes imports more expensive whereas quota is a kind of quantitative restriction on imports. Quota on textile and apparel has been removed on Jan 1, 2015 because of the Agreement on Textile and Clothing. It is good news that the US will be playing such an important role in the T&A industry. This will hopefully provide more jobs for this growing industry in our country and help businesses grow. I was very surprised to read that the US is the fourth largest textile exporter in the world, while being the largest importer in the world. Hopefully imports can reduce with this new TPP. recall the nature of textile manfaucturing and the stage of developmtent theory we mentioned in the class–this is why the U.S. remains a leading textile manfuacturer and exporter in the world. Almost all countries can produce apparel, but only a few can make high quality textiles. on the other hand, imports will only increase after the implementation of TPP. promoting exports does not necessarily mean a reduction of imports, especially given the nature of today’s global supply chain. The TPP is proposed as a seemingly “balanced” deal for the U.S. T&A industry. As previously commented, we know that this is not true – the deal like any other will come with winners and losers. The TPP will present new export opportunities for the U.S. in the Vietnamese and Japanese T&A markets, but staying true to its reputation as the largest importer of T&A products in the world, won’t the we also likely see an increase in imports to the U.S.? Which would likely outweigh the new export ventures. I think it is very interesting that Japan, Vietnam, Malaysia, and New Zealand are cutting back so much on the taxes of imports and exports to the United States. These countries have stated to cut back 50 to 99 percent of these taxes to the United States immediately up until the next seven years depending on which country it is. These promises make such a great impact on the U.S. textile and apparel industry in the years to come. It is definitely beneficial for the United States to receive such generosity from these country’s. The TPP recognizes America as the fourth largest exporting countries, therefore this will definitely help the United States in terms of costs and efficient ways of conducting trade. This is very advantageous to the United States and increases the relationships internationally that these countries have with one another. Another important factor to note is that since the U.S. is one of the leading exporters, getting these costs removed will increase the chances of trading even more. good thinking! this reflects the nature of TPP–it is a comprehensive free trade agreement which involves many sectors (T&A is one of them). Vietnam, Malaysia and New Zealand are willing to have a deep cut of their tariff on some T&A products, probably because they get something in return from the US in some other sectors/areas. Trade policymaking is always an art of balancing. I think the fact that the US is the largest textile importer but only the 4th largest textile exporter just shows how drastic the difference is between imports and exports in the US. We constantly hear that US needs more jobs at home for the T&A industry but these statistics really get the point across. The fact that only 372,300 T&A jobs remain in the US is shocking compared to the 318.9 million people who live in the United States. Hopefully, the TPP will help the US create more jobs or at least prevent the deterioration of the current jobs. very good! happy to see you start critically reading (and analyzing) these numbers! The first thing that stood out to me here is the potential regarding Vietnam. I cannot remember where it was (either case study readings or another article on here), but somewhere mentioned that TPP partners such as Vietnam would be significantly more likely to obtain materials that it mentions from Japan rather than the US. This leads me to question a lot of these facts and wonder what the other side to these facts are. While these facts and statistics may be true, they do not necessarily take into consideration different countries’ preferences, attitudes, etc. that could largely impact the way things ultimately play out. While I believe that it is good news that the United Sates will play such a large and important role in the textile and apparel industry, I believe that it should not be overlooked that while we are the largest textile importer, we are only the 4th largest textile exporter. Keeping to the concept of comparative and competitive advantage, it is not advantageous for the US to attempt to increase their T&A exports in order to compete within the global market; however, I do believe that as the industry attempts to expand, more jobs and opportunities will be created. Hopefully, with new jobs being generated, the 372,300 T&A jobs which currently exist will drastically increase, although it will never have the ability to compete with the foreign, commonly outsourced countries- we can not compete with their wage rates, and have far too many factory/manufacturing regulations to produce the products that companies are looking for in order to remain competitive in the industry. good thinking (especially applying concepts/theories learnt in the class). I remember 2 years ago US was still the 3rd largest exporter and then was overpassed by India. This reflects industry dynamics. However, for certain products (such as high-end technical textiles), US textile industry is doing very well. US based companies will continue to explore niche market opportunities rather than compete on volumes. The report shows that TTP seems to be heavily weighed in the US’s favor, possibly allowing them to gain rank for largest exporter. This growth could help grow jobs in the US T&A industry. Yet simultaneously as the world’s largest importer, partnered countries who are reducing or eliminating tariff on US goods could benefit from this agreement as well. They will be able to export their goods to partnered countries in exchange for reduced tariffs, and focus their manufacturing efforts on creating goods that give them a comparative advantage. After reading the various case studies this semester about the US declining in T & A jobs and losing business exporting, this is great to hear. 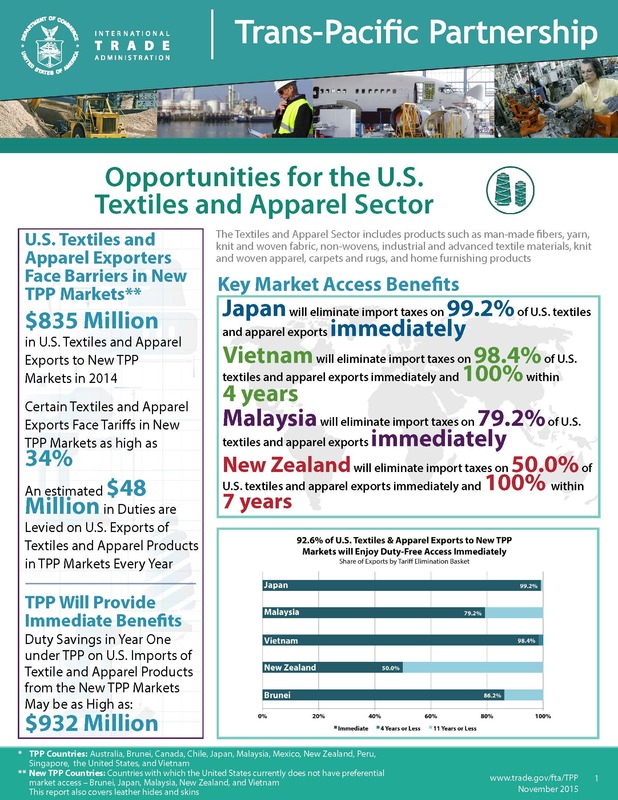 The TPP creating these opportunities for our country along with Japan and Vietnam demonstrates truly how important and effective the partnership is in uniting our world through textiles. The US being the 4th largest exporter in the world is surprising to hear considering our last case study focused on the rapid decline of our exports. The fact that there are only 372,300 T&A jobs in the US is also shocking compared to the vast amount of people in the United States. I still believe there can be great improvement in creating more jobs within the country, but the TPP creating these opportunities is still a great contribution to that goal. I find that these developing countries such as Vietnam, Malaysia, and Japan cutting back on some of their taxes could change the benefits and reasoning behind the TPP. This gives us more money to save on the textile exports from these countries. However, allowing these countries to import to the U.S. duty-free still poses as a threat to the U.S. as the fourth leading textile exporter in the world. If we start taking advantage of importing from other countries, then we are taking away from the economic benefit we could have from exporting. I think it will only cause us to decline in the ranks of global textile exporters. I am very curious as to how this will effect the future of the US textile industry and how the American public will react the the TPP. Despite regulations and embracing the “yarn forward” aspect, I am wondering if there will be any effect on our economy and jobs. We are the fourth largest exporter of T&A in the world and I would like to see if post-TPP this increases or decreases our number. I would also like to see what other countries involved will gain in eliminating their import taxes on US imports. You get the point. Personally, I think TPP will have an impact. I am not very confident about those yarn and fabric manufacturers which currently supply apparel factories in central America. Vietnam will take away many businesses. This is why you see even in the report, DOC emphasizes technical textiles. Somehow TPP will accelerate restructuring of the US textile industry. One thing about TPP that I picked up on in this article and in our case study is that they say describe the deals for the countries as balanced. I do not agree with that phrasing at all. As you know, the countries involved with TPP all were given certain regulations and policies to follow, including the US. Originally there was a quota reduction on the US that was meant to increase our country’s exports and help protect domestic T&A manufacturers. At the same time, other countries’ T&A goods were being looked at by the US because of their policies set by TPP, which may affect our exports if we choose to increase our imports. Now, the quota has been removed, so I am wonder what effect will this have on how much the US imports and exports and from where? This goes back to my opening statement of TPP saying the deals are balanced. Importing and exporting is a business with a lot of money to be made, in all situations where this is the case, nothing is balanced because in order for someone to be successful, someone else has to be unsuccessful. I think this agreement could be very good for United States textile producers. Lowering and in some cases eliminating tariffs on textile exports will most likely lead to an increased number of exports. I think this will also lead to a higher number of apparel imports. Countries such as Vietnam are quickly becoming a larger source of apparel manufacturing. While these deal may not be good for apparel manufacturers in the United States it will be better if countries such as Vietnam are using U.S. made textiles. I feel that these statistics really highlight the of US apparel and textile imports in to their exports. The US is the largest apparel and textile importer, however they are the fourth largest exporter. And with the decrease and/or elimination of tariffs, the US will only import more because of the cost benefits. It is important that we focus on increasing textile and apparel jobs in the US because there are only 372,300 left in manufacturing jobs in the US. This is an extremely small number in relation to the rest of the world and the large scale of the industry, however, it is also important to consider the comparative advantage that third world countries have over the US considering their cheaper labor costs. The US is an industrialized economy and the jobs available have progressed as the people have progressed. The US should focus on manufacturing products that require more capital and higher knowledge such as technology surrounding the textile industry. Additionally, their textile industry will highly benefit from the reduced tariffs.